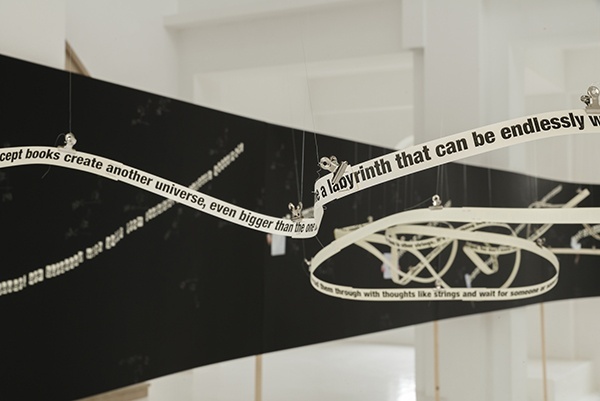 Through films, diagrams, drawings and texts, Zbynek Baladran offers various systems of knowledge representation. 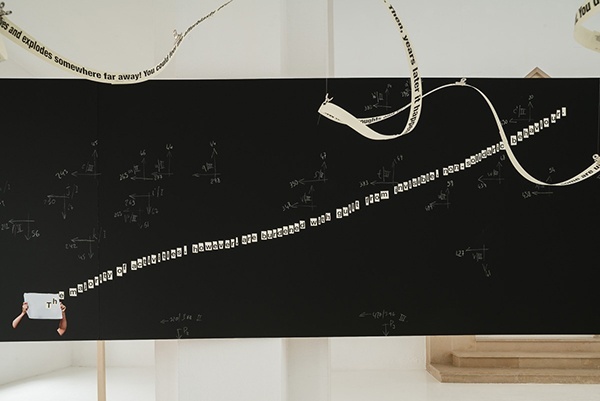 He uses these forms to convey concepts and ideas, but it is also a way of giving our senses more direct access to them, as well as a means of combining philosophical questions with poetical and visual modes of transmission. 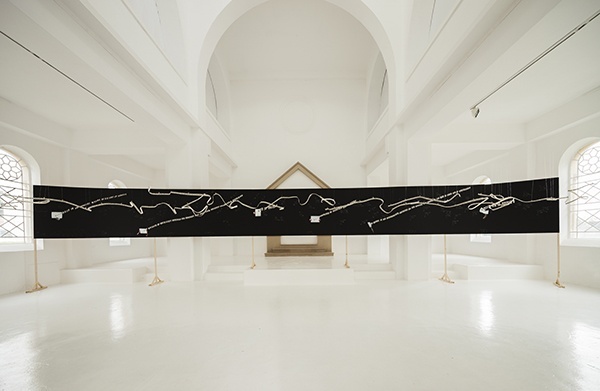 The work that opens the exhibition consists of a serpentine sculpture made of pieces of paper that spread through the space at eye-level. 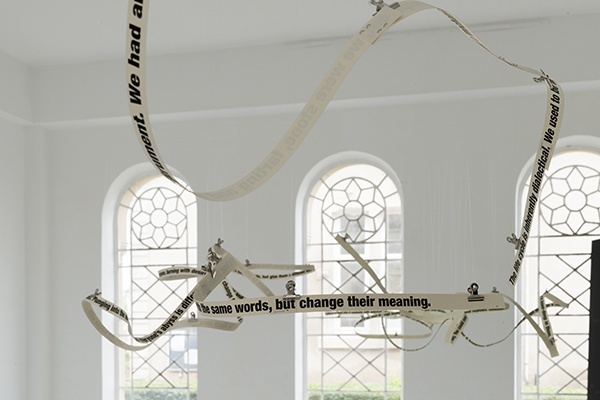 Zbynek Baladran turns us into active readers, because one has to move, crane one’s neck, step forward or step back in order to read and understand the meaning of the words printed on the ribbons. 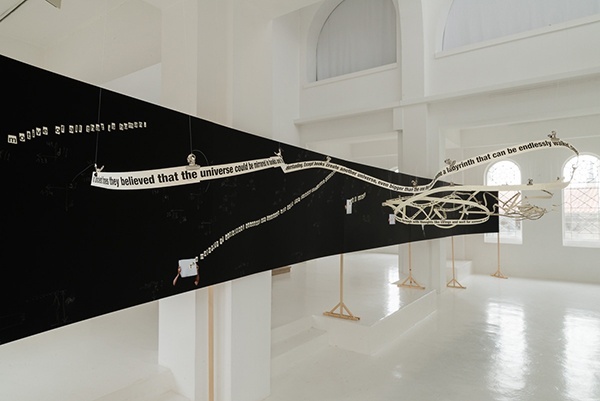 Like a line of thought that the artist would like to make tangible, the installation is something of a mental diagram, a labyrinthine cartography made up of superimpositions that intentionally splinter, fragment and put holes in discourse. Many of the works of Zbynek Baladran (born in Prague in 1973) are infused with the inner doubts and resistance experienced by the generation that lived through the historical, political and social upheavals of the countries of the former Soviet bloc after 1989. 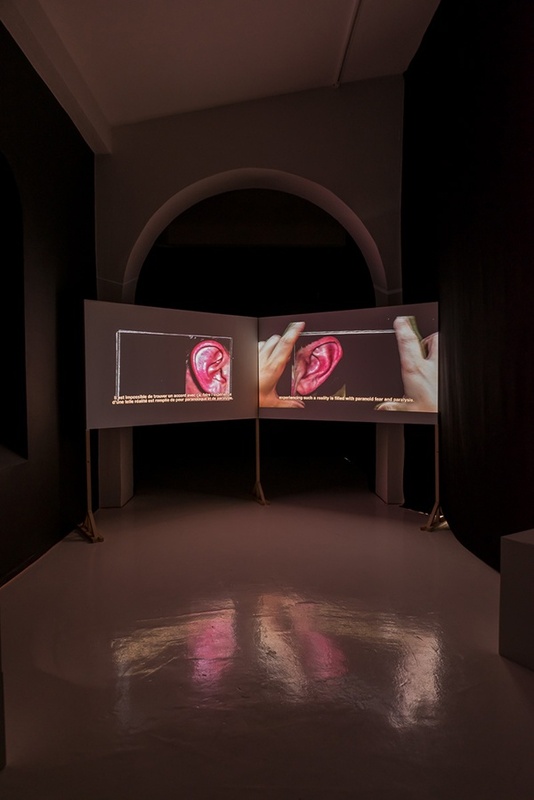 The feeling of inadequacy and dislocation provoked by a highly paradoxical freedom, offered by a so-called democratic world, ended up producing what the artist calls “mental spasms”. 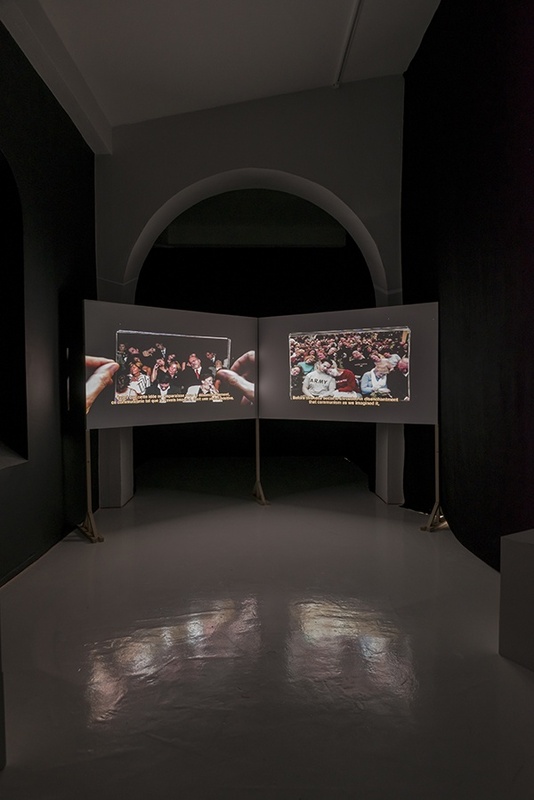 More than just disenchantment, it was a kind of profound helplessness that took hold of the everyday life of this generation, which oscillated between the desire to adapt to a new liberal, individualistic environment and the search of a new sense of the common. In his most recent films, these questions are still central. Using minimal resources with a DIY spirit, Zbynek Baladran compiles a variety of images taken from the grey, apathetic media flow. He reconstructs these heterogeneous sources while lending them the rhythm of his own manipulation. There is no obvious correlation between the array of images and the voiceover text. 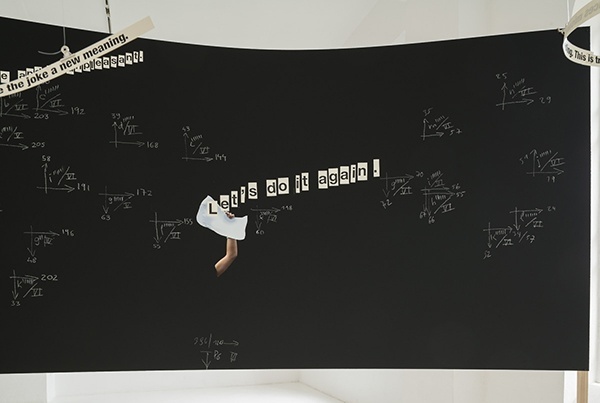 The working method he uses involves continual misunderstanding and contradiction, as the exhibition title suggests. In fact, “Dead Reckoning” is a technical term that designates the calculation of a vehicle’s position based on the distance travelled from its point of departure. Alongside the data used (such as speed), dead reckoning incorporates more fluctuating parameters like wind and sea currents. 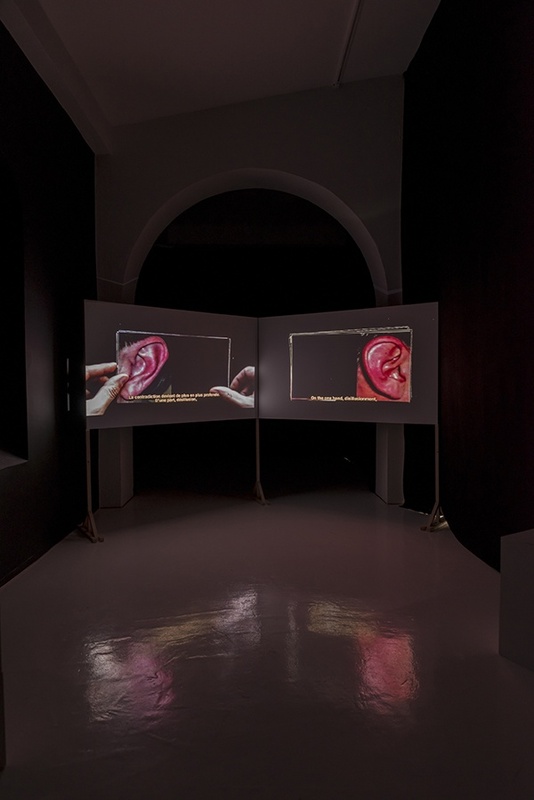 Reflecting this paradoxical science, whose purported objectivity incorporates error and uncertainty, the installation and two films produced by Zbynek Baladran for the Synagogue de Delme stem from the same navigation method. 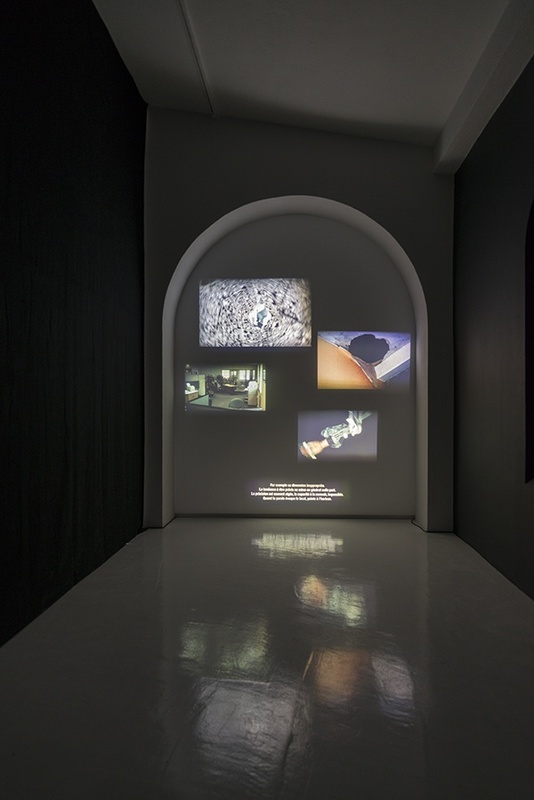 The films Dead Reckoning (produced for the exhibition) and The microscope and telescope of Time (2013) are products of the artist’s research, which revolved around identifying the symptoms and contradictions that affect society as a whole. Paranoia, anxiety, hysteria and psychosis are the modern, internalised individual translations of a broader historical trauma in which class struggle, colonization and consumerism all clash.